It has two stars, divided into comfort, quality and the personalized service we offer to all our clients. Our building is located between Rúa do Vilar and Rúa Raiña, two of the most central streets of the city. 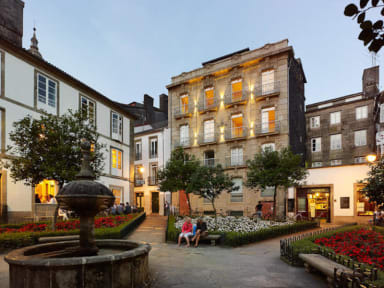 Near, you can find Pilgrim's Office, and the Plaza de Fonseca, where is the Pazo de Fonseca, (old University of Santiago de Compostela). 2 Minutes walk from the Cathedral. Surrounded by a very pleasant and warm atmosphere in the heart of the city. Just around the corner you can see already the impressive Plaza del Obradoiro and its icon: the Cathedral of Santiago de Compostela. You, as a visitor, can have rooms in Santiago in the best possible location. 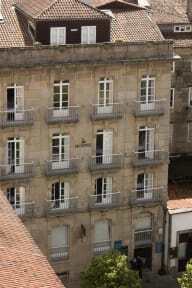 Montes Boutique & Guesthouse has single and double rooms to sleep in Santiago de Compostela with views to the gardens and Palaces of Fonseca, Rúa do Vilar or the Cathedral. All the rooms in this guesthouse with charm have a great comfort and have additional quality services, within its classic-modern style. This accommodation is has an optimal relationship quality-price. You will not find in this Hotel only accommodation but also familiar and personalized treatment in a relaxed and quiet atmosphere typical of a hotel with charm. In our hotel, sleeping in Santiago will be an unforgettable experience. This lodging has enormous symbolic value in the context of the history of the pilgrimage to Santiago de Compostela, because it is at the end point of all historical ways to the city. Likewise, it constitutes an accommodation suitable for pilgrims arriving Santiago de Compostela, because the Pilgrim's OIffice is very close to this hotel. It is impossible to find, in the heart of Santiago de Compostela, in the outline of the Km 0 of the Camino de Santiago, an accommodation for pilgrims, better placed than this guesthouse with charm!